You can see my article as published by news.com.au here or read below. American philanthropist Andrew Carnegie believed ‘there is little success where there is little laughter.’ Spend an hour with the highest point scorer in the history of State of Origin, for a book called ‘Winners: And How they Succeed’ and you realise that saying is proportional: Johnathan Thurston laughs a lot. Affectionately known as JT, Thurston was selected by the former 10 Downing Street spin doctor, Alastair Campbell, to be interviewed for his UK best-selling study into winners across sport, business and politics. He is in good company. Flick through pages of the book and you can read about Bill Clinton and Barack Obama, Anna Wintour and Richard Branson, Shane Warne, Layne Beachley, Leigh Matthews. As the latter names hint, there is a trend to one chapter. Prior to a case study on Her Majesty the Queen is a chapter on the mateship spirit of Australia, loyalty before royalty, in which Shane Warne suggests his nation’s three most important words: never give up. Thurston defined. This says Campbell, is a winner’s mindset: the flexing of what Ironman World Champion Guy Leech describes as ‘the most important muscle’, the one between your ears. Without this, Thurston would not have three Daly M medals or two ‘best-player-in-the-world’ Golden Boots. In the corner of the cafe, a couple are looking over to see if it is the larger-than-life guy, metaphorically and in print, who adorns billboards at Townsville Airport. It is but Thurston is oblivious to his surrounds as he details a second of Campbell’s signs of success: a strategic mind. You may think washing cars from 7 am until 3 pm as Thurston was doing, has nothing to do with becoming a rugby league player; it has everything to do with becoming a rugby league player. 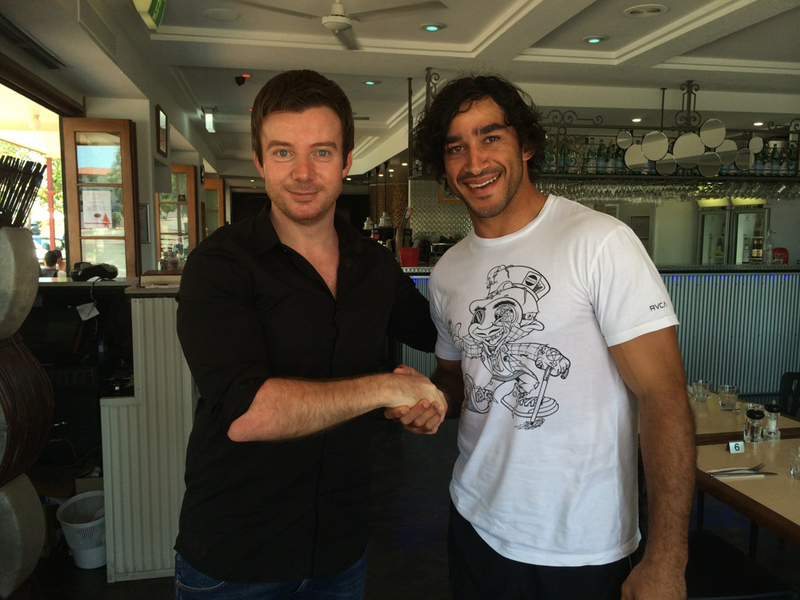 Thurston was signed for zero playing fee by the Canterbury Bulldogs. He was not washing cars for fun, he was washing cars to fund his training from 4 pm to 8 pm, to keep moving towards his objective: to keep his dream alive. This is what Campbell calls OST: objective; strategy; tactic. Objective: become a great rugby league player. Tactics: align all aspects of life to enable training. Strategy: train harder than the best. For Thurston, there was no point training to an expected level; it was the unexpected level that counted – when he would go beyond all others. When asked how many sit-ups he did Muhammad Ali responded: “I don’t count my sit-ups. I only start counting when it starts hurting. That is when I start counting because then it really counts. That’s what makes you a champion.” Thurston only started training when he had surpassed the training of the best he had studied. There are two types of winners in Campbell’s book: extreme mindsets who equate losing with dying and those who never contemplate losing as they are focussed 100% on victory. Thurston is the latter. When questioned on risk he turns to face the window, his blank expression reflected back an answer without the need for words. When doubt is nonexistent, risk cannot exist. This question simply did not compute. He returns to more comfortable ground. The look Thurston gives ‘the boys’ is affirmation following time he puts in to another essential part of Campbell’s keys to success: teamship. ‘Without a great team, you cannot achieve great things,’ says Campbell. Thurston knows this. “I have been able to win all those individual awards, but that is not what drives me,” he says alluding to that elusive Premiership with the Cowboys, reclaiming the State of Origin for the Maroons, and regaining his shirt for the Kangaroos – ordered by preference. He is a without doubt a leader, unquestionably talent, and as he describes that moment of heartbreak, when his match-winning try was disallowed following a 30 point fight back in last year’s semi-final, you hear a warrior talking too. Gorden Tallis asked Thurston for comment immediately after that game. Thurston was lost for words. Defeat does not compute. Ask him about winning and you get a very different reaction. Acclaimed mental skills coach Andy McCann says in Campbell’s book that those that get to the top have one of two mindsets: a go to mindset, which is where your central motivation is the desire to win, and a move from mindset where your big driver is fear of failure. A grin spreads across his face before his laugh reverberates around the cafe. Carnegie was most certainly right. ← Electorate first; media second.